I got this leaflet for Lin Pei-hsiang 林沛祥 in my mailbox today. Lin is vying for the KMT nomination in Keelung City. 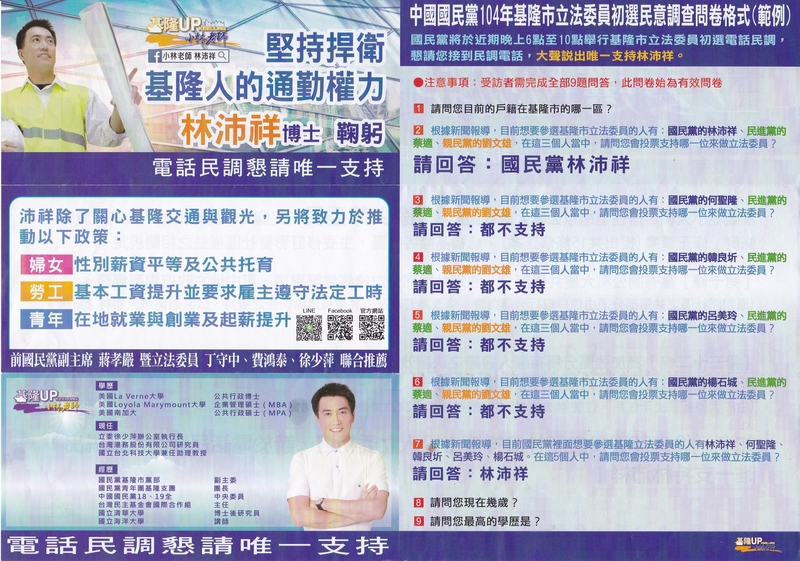 On the right side of the fold, Lin teaches voters how to respond if they are sampled in the KMT’s polls. I don’t think this ad hurt Lin, but I don’t think it helped him very much either. The most basic problem is that Lin put this leaflet in my mailbox – and presumably everyone else’s mailbox as well. Lin wants to teach his supporters how to effectively answer the survey questions, but instead he is teaching everyone, including people who support his opponents. I have heard of a candidate who did much better than expected in the polls by activating a local organizational network. Instead of teaching everyone, the campaign only taught a few trusted people in each neighborhood. Each of those people was then supposed to find a couple dozen people who they could count on to support the candidate and teach them how to answer correctly. In this way, that candidate only educated supporters and helped to maximize the effects of their support. Lin isn’t doing that. He doesn’t have a good enough network (unlikely), doesn’t know who his voters are (perhaps), or doesn’t understand how to game the system (probably). The orange characters in the purple section instruct voters to tell the interviewer, “I only support Lin Pei-hsiang.” I’m not sure why they want the respondent to say this (and everyone seems to want it), since that doesn’t count as an answer to any specific question and, as the line right below it points out, they have to answer all nine questions for the interview to be considered a valid case. Question 3-6 ask the same question, but substitute the other four KMT candidates in the race. Respondents are instructed to answer, “I don’t support any of the them.” This is a fine answer for Lin. However, if you really wanted to support Lin, you would tell the interviewer you supported the DPP candidate in these four matchups. That doubles the effect of your support for Lin. However, many KMT identifiers can’t bring themselves to express support for another party, so it may be best not to ask them for too much. Also, Lin wouldn’t want to tell voters to do this in a publicly distributed leaflet. There might be repercussions. Again, an unobservable network teaching supporters one-on-one is the way to go. Questions 8 and 9 are demographics (age and education level). No instructions are given. I’m not sure if the KMT uses these questions to do weighting. If they do, I suppose you could really maximize your influence by claiming to be a 23 year old with a post-graduate degree. However, the more people who do that, the less influence each one has. It’s probably not worth it for a campaign to try to organize its supporters to lie on the demographics questions. 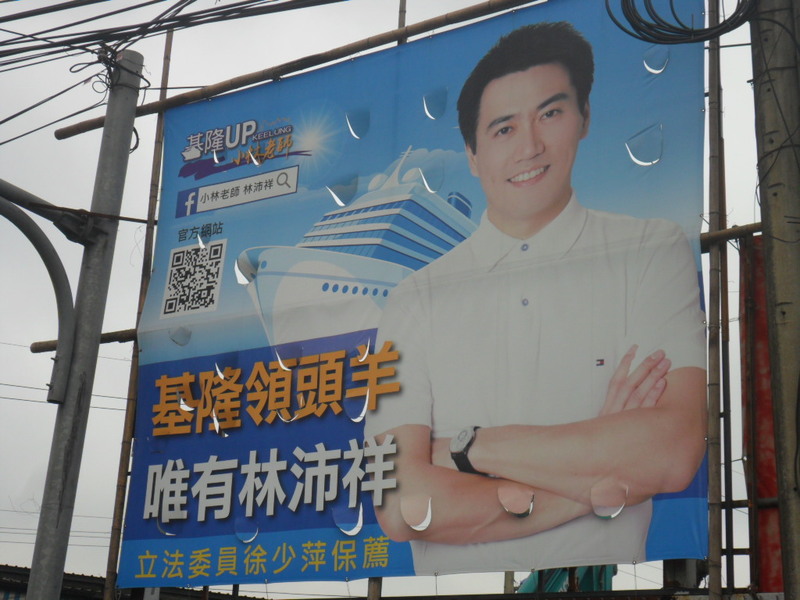 I don’t think this ad is helping Lin Pei-hsiang do better in the polls. I don’t think it is hurting him either. The only really helpful pieces of advice are 1) the reminder that the respondent has to complete all nine questions, and 2) the instruction to not support KMT candidates in the other four matchups. I supposed it is possible that more of Lin Pei-hsiang’s supporters will read this leaflet (and supporters of other candidates will spit on it and throw it away in disgust), so he might get a mild advantage. However, any advantage will be very small. I do expect Lin Pei-hsiang to win the KMT nomination, and he will probably also win the seat in January. There are advantages to being the son of a mayor (1989-1997) and a longtime legislator (1995-present) in a blue city. Following yesterday’s proposal in the KMT Central Standing Committee to activate a process to draft the party’s presidential nominee, the tone of today’s news seems slightly different. As I pointed out in my previous post, Hung did much better in the question that asked whether respondents supported her for the KMT nomination than in the head to head question of whether they would vote for Hung or Tsai. Today Hung is complaining that the KMT should use the “support” question rather than the “comparative” question. In fact, she is complaining that they have changed the rules in order to block her. Further, Hung is complaining that the KMT is not planning to hold a forum for her to explain her platform to the public. If they don’t want to do it, they should give her back the NT 7 million registration fee so that she can hold the forum herself. As for the proposal to put her in a four-way poll with Chu, Wang, and Wu, Hung rejects this as “unfair.” They should have registered in the first place. Why are these stories significant? For the first time, Hung seems to be publicly complaining that the KMT is actively trying to block her. Up until now, she was always sunny and full of confidence that the KMT process would be fair, she would pass the 30% threshold, and the KMT would duly nominate her. This new tone might reflect a shift in her perception. Perhaps now the KMT has finally gotten serious about forcing either Chu or Wang to take the nomination, and it is taking steps to ensure that she doesn’t get in the way. Her complaining also reflects the sense that she has a real chance to pass the 30% threshold and win the nomination. If she didn’t, she wouldn’t bother protesting so forcefully. I think her quest for the nomination started out as a way to force the other people into the race. However, somewhere along the way, it dawned on her (and everyone else) that she might actually win the formal nomination process. This realization has forced the rest of the KMT to get serious about drafting Chu or Wang, which was probably her original intent. However, Hung might no longer want that outcome. The KMT presidential nomination is starting to come into focus. At the KMT’s weekly Central Standing Committee meeting, legislator Lu Hsueh-chang 呂學樟 proposed the KMT activate a mechanism for drafting a candidate. His proposal was that they should hold a poll with Chu, Wang, Wu, and Hung, with the winner being the presidential candidate and the second being the vice-presidential candidate. Chu responded that the KMT would respect its procedures, which for the moment means that he is committed to letting Hung have a crack at breaking 30% in the polls and winning the nomination. However, I think we can see how this is going to shake out. If Hung doesn’t pass the threshold, the party is going to demand that Chu and Wang are considered. The strongest one is going to be presented with the nomination, whether he wants it or not. Since the decision mechanism will almost certainly be some sort of poll, that basically eliminates Wu. It also means that Ma won’t be allowed to block Wang directly. In the meantime, the KMT has to decide the seemingly technical but actually quite critical question of whether to filter out respondents who self-identify as green camp supporters. A week ago, Hung proposed that the KMT should use a filter question because she thought that eliminating green supporters would help her defeat Yaung Chih-liang in a two-way race. However, Yaung is now out of the race, and Hung’s opponent is the 30% threshold. Many people are wondering if she will be better off with green supporters in the polls. 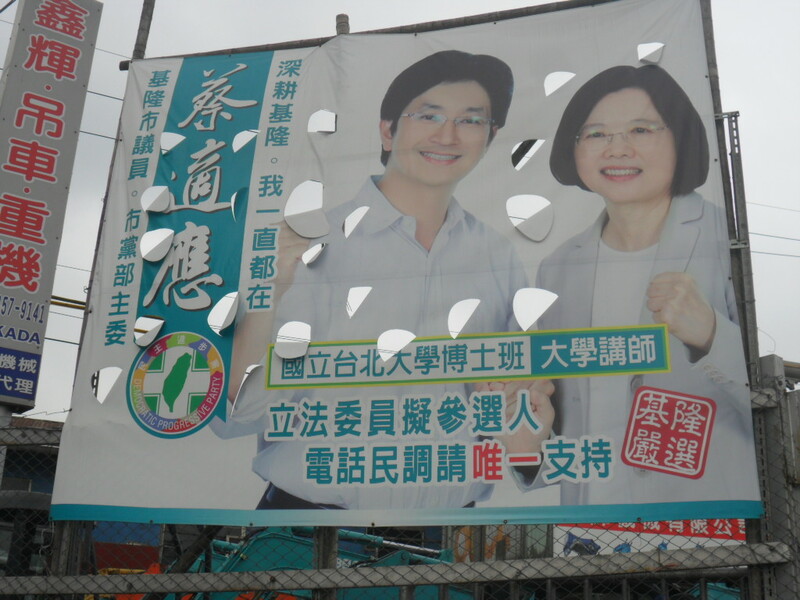 The thinking is that green supporters believe she is the weakest opponent for Tsai, so they will strategically express support for Hung in the polls. Whaddayaknow, the China Times released a useful poll today. 34% of respondents supported Hung to become the KMT nominee. Look, that’s more than 30%! CT helpfully provided some demographic breakdowns, including by camp. 19% of self-identified green camp supporters expressed support for Hung as the KMT nominee. Wow! Since I can’t believe any more than 2-3% sincerely support her, that is a lot of strategic voters. One of every five or six green camp identifiers is strategically supporting Hung, and there is no organized campaign to tell them to do so. Who says voters are stupid sheep? Still, while 19% is higher than we might expect, it is a lot less than 30%. In this poll, Hung would be better off filtering out the green supporters. Another interesting result is that blue camp supporters apparently aren’t terrified at the prospect of a Hung candidacy. 65% supported her as the nominee, while only 14% did not want her. Aside: The China Times poll asked whether respondents supported her as the KMT nominee. I think the KMT poll will ask whether a respondent would vote for Hung or Tsai, and Hung has to pass 30% in that hypothetical matchup. That’s a much different question, and Hung only got 17% support on that question in a recent TVBS poll. For one thing, the latter question will evoke far more sincere responses. Call me cynical, but I wonder if the China Times wanted to sell some newspapers and deliberately used a question on which Hung could get 30% support. Still, I don’t think it is out of the question that Hung will be able to pass the threshold, especially if the KMT uses a filter question. In conclusion, if the KMT wants to give Hung a chance to win, they should use a filter. If they want to avoid her at the top of the ticket, they should include the entire population. Wait, there’s one more thing to consider, and it is perhaps the most important of all. The decision of whether or not to use a filter will set a precedent. If Hung does not pass the threshold there might be another poll, between Chu and Wang. Wang is much more popular with green voters than Chu. The recent TVBS poll shows Wang with 13% support among DPP identifiers and Chu with only 7%. If a filter is used, Chu will probably win the poll. If no filter is used, Wang has a good chance. The Ma faction, which supports anyone but Wang, should thus push hard for a filter. The filter would help Hung and Chu, both of whom are acceptable to Ma. The Wang faction should resist the filter, both to ensure that Hung doesn’t pass the threshold and to help Wang win any potential poll against Chu. What about the Chu faction? I haven’t got any clue, since I don’t know if Chu actually wants to be the nominee. If he wants to be the nominee, he should … just say so! Everyone will step aside. If he doesn’t want the nomination, he has a dilemma. The filter will help Hung in the current poll. However, if she doesn’t pass the threshold, the filter might condemn him to getting the nomination. I was a guest on Taiwan This Week, talking about President Ma’s seven year speech, the KMT nomination, and controversial language about migrant workers in textbooks. I generally don’t pay much attention to new and unproven parties. I prefer to make them prove that their viability before I devote much energy to them. Still, this story is too much fun to pass up. New parties make up all kinds of outlandish claims, so I shouldn’t be surprised when one claims it can win lots of party list seats in the upcoming legislative elections. Still, this one stretches the limits of credulity. The MCFAP claims that it can win 10 PR seats, and it has the numbers to back that up! Solidarity.tw picked up on a detail that I missed when I originally read the article in Chinese. The MCFAP claims that it asked voters to cast invalid votes in the 2014 elections, and voters responded by casting 1.8 million invalid votes. If the MCFAP can consolidate these 1.8 million votes, it can win 10 PR seats. Now wait just a minute? Were there actually 1.8 million invalid votes? That sounds like a lot, considering there were about 13 million total votes cast in the 2012 presidential election. Surely we would have noticed if 15% of all votes had been invalid in 2014! So I went back and checked. Sure enough, there were 1.8 million invalid votes. Well almost. You have to round up from 1.72 million, but that’s just an accounting error. Of course, that 1.72 million is the total number across all nine types of elections, which seems like it might be cheating a bit. In the mayor and magistrate elections, there were only 250,000 invalid votes. Almost half of the invalid votes (857,000) were in the neighborhood chief 村里長 elections. So if the MCFAP thinks the legislative elections are just like grassroots elections and not at all like mayoral elections, they are halfway to their claim! Alternatively, they could try to let their supporters cast three to five votes apiece, just like they did in 2014. That seems fair, right? But wait, there’s one more problem with MCFAP math: 1.8 million votes doesn’t get you 10 PR seats. In 2012, the TSU and PFP combined to win 1.9 million votes. (That’s 10% more than the total number of invalid votes from last year, by the way.) For those 1.9 million votes, they got 5 seats. The A in MCFAP stands for academics, by which they mean educators. Let’s give the party the benefit of the doubt and assume those educators are all Three People’s Principles 三民主義 teachers since I’d be terrified to find out any of them taught math. Doesn’t that name sound like it should be some sort of Scottish Independence Party? Chinese name: 軍公教聯盟黨; literally Military, Civil servants, and Educators Alliance Party. It’s always good to tell the vast majority of society that your party won’t be looking out for their interests. Why are they both an “alliance” and a “party?” Shouldn’t one of the teachers tell them that redundancy makes for bad writing? How could they translate that name into “China Production Party” anyway? The party’s website doesn’t explain what the acronym stands for. Solidarity.tw thinks it is Military, Civil servants, Firefighters, and Academics Party. I suppose it could also by Military, Civil servants, and Fducators Alliance Party. 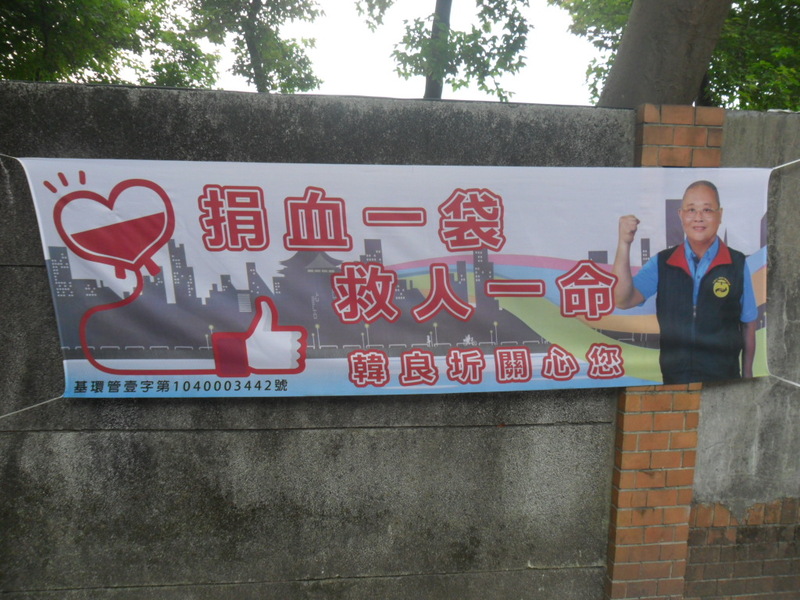 The legislative race in Hsinchu County is shaping up as a really weird one. The incumbent is Hsu Hsin-ying 徐欣瑩, who won in 2012 as a KMT candidate. 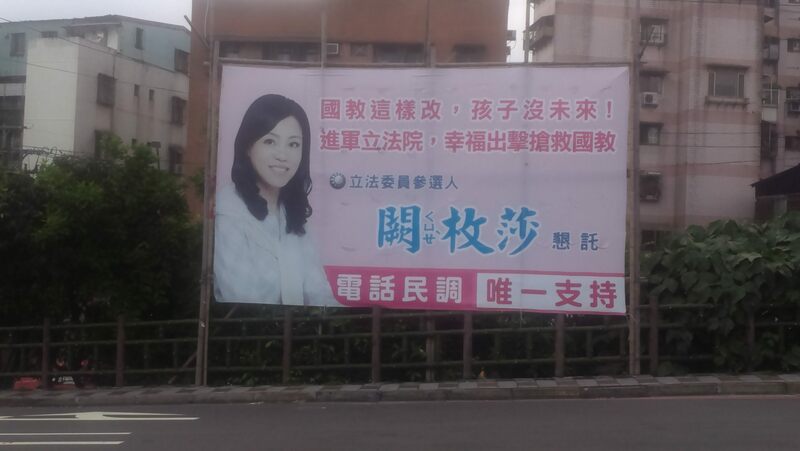 She is running for re-election, but not under the KMT label. She made the very strange decision leave the KMT – remember Hsinchu County is solidly blue territory – and launch her own party, the Min-kuo Party (MKT). Good luck with that. Last week the KMT settled on its nominee. It has chosen county councilor and former legislator Lin Wei-chou 林為洲. Lin was elected to the legislature in 2004 as a DPP candidate. He was even the chair of the DPP county party branch and ran Chen Shui-bian’s 2004 campaign in Hsinchu. So, let’s see. The former KMT politician is now the MKT leader, while the former DPP politician will now be the KMT champion. But wait, there’s more. The DPP hasn’t finalized its nomination yet, but one of the leading contenders is Cheng Yung-chin 鄭永金, a veteran Hsinchu politician. Over the past two decades, Cheng has been county council speaker, legislator, and county magistrate. As you might expect by now, he did this all as a KMT party stalwart. So, in addition to the other two, we might also have a former KMT politician representing the DPP. What is going on here? Don’t party labels mean anything in Hsinchu? This kind of rampant party switching is simply unthinkable in a place like Taipei. The difference has to do with the personal vote. Political scientists often (crudely) divide voters into party voters and personal voters. The former make their choice solely on the basis of the party label. They will vote for anyone nominated by their party, and they will never vote for anyone from an enemy party. Personal voters might have some party preferences, but they also care about other things. They might vote against their preferred party (if they have one) because a they have a personal connection with the candidate, the candidate takes a certain position on an issue they care deeply about, the candidate has done some sort of constituency service, the candidate represents their social group, the candidate has bought their vote, the candidate is good-looking, or anything else. In places like Taipei, society is more atomized. People move in and out all the time, and you might not know your neighbor. Without dense personal connections, voters rely more on issues and party labels to make decisions. In places like Hsinchu County, social networks are denser. People are more likely to know each other, and politicians can build networks along the social structures. Parties matter, but they aren’t the only thing and sometimes they aren’t even the most important thing. Politicians who have built up a strong personal vote can bring much of that support along with them if they ever find they need to change parties. This interplay between personal and party votes has meant that when politicians change sides, they usually come from more rural areas. The other district this year with multiple important party switchers is Changhua 1, which (by Taiwan’s standards) is not that urbanized. An even stronger example occurred a decade ago, when most of the Chiayi County Lin Faction switched sides and joined the DPP. Anyway, just remember that the Hsinchu race could be former KMT against former DPP against former KMT. So if you have a strong party ID, it should be easy to decide who to vote for. Hey, remember when Alex Tsai 蔡正元 announced he wouldn’t run for re-election, leaving a solidly blue district wide open for any famous national KMT celebrity to simply drop in and take over? There were a few local candidates, but who cares about them? After all, have they ever even been on TV? The national speculators came, of course. Among the eight candidates who originally registered were three former legislators who didn’t think they could win in their old districts, an author, and Sean Lien’s 連勝文 puppet. After the first round of polling, four of the five realized that the local candidates that they overlooked had beaten them soundly, and they conceded defeat. However, the last former legislator, Chiu Yi 邱毅, stayed in the race. After all, with all the other “real” politicians out of the race, he would get all the support from the ideological voters while the local candidates would have to split the votes of people who cared about constituency service. Well, the final results came out this week. City Councilor Lee Yen-hsiu 李彥秀 won with 32%, City Councilor Chueh Mei-sha 闕梅莎 was second with 27%, City Councilor Wu Shih-cheng 吳世正 was third with 22%, and former legislator and nationally known TV personality Chiu Yi came in last with a mere 17%. Gee, maybe this district wasn’t so wide open for just any old KMT reject after all. Anyway, I’m pretty sure that the eventual winner of this seat will be a city councilor, not a person with national-level experience. 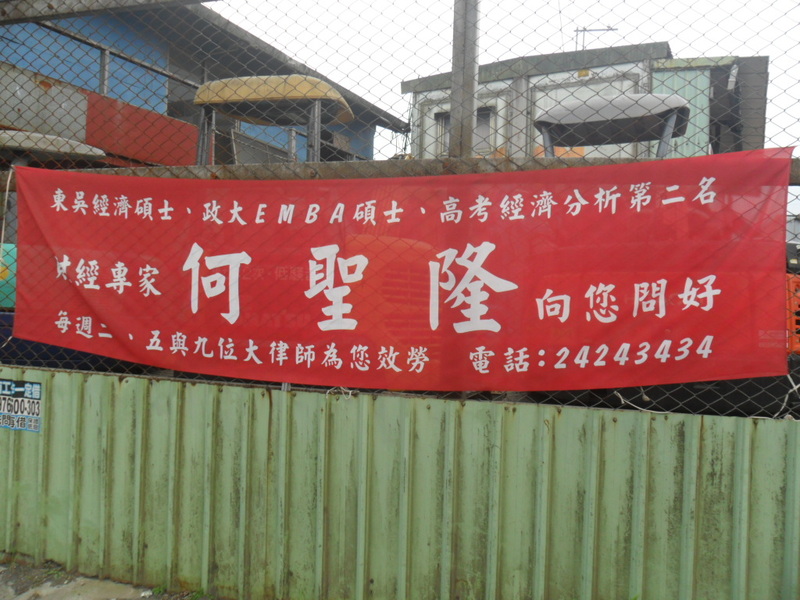 In the late 1990s when the DPP and then the KMT started experimenting with telephone polls to decide nominations, I wondered why the candidates never bothered campaigning. They went crazy putting up billboards, flags, and banners for the general election, but they did nothing for the primary. One of the main purposes of the telephone primary is precisely to make the primary electorate more like the general electorate. The whole population is eligible, and you don’t know who will be sampled. If you want to get 30% support in a telephone survey, your best bet is to have 30% support in the general population. So it didn’t really make sense that the candidates didn’t advertise or campaign energetically. Over the last two decades, the politicians have slowly figured this logic out. Nowadays they do campaign, though they still don’t start early enough or campaign energetically enough, considering the fact that the nomination race is more critical in many races than the actual general election. This is all a long way of saying that I have taken a few pictures of political ads for this year’s legislative nominations. With one exception, these are from my local race in Keelung City. It seems that both sides have decided to hold polling primaries here, and the candidates are advertising a bit. Let’s look at some of the interesting themes. This is a pretty standard ad. Tsai Shih-ying poses with Tsai Ing-wen, tells you he is a local guy, emphasizes his good education and his jobs (city councilor, head of city party branch), and asks voters to “only support him” in the poll. Cheng Wen-ting is also running for the DPP nomination. The main them of her campaign is that she is isn’t a city councilor like the other two DPP aspirants. She suggests that voters just put the other two in their current seats, and they should stay their for the rest of the term. If she is nominated, the DPP can win a legislative seat without giving up a city council seat. We got a leaflet in the mail in which she hammered this point even more forcefully. This theme has popped up in several places during the primary season. It was prominent in the DPP’s contests in Kaohsiung, and it may be at the heart of Eric Chu’s hesitancy to run for the presidency. The problem is that the local elections are too close to the national elections. Local politicians have to run for re-election to stay in the public mind, but then they have to almost immediately switch gears and start running for national office. Just one more reason to reform the electoral calendar. 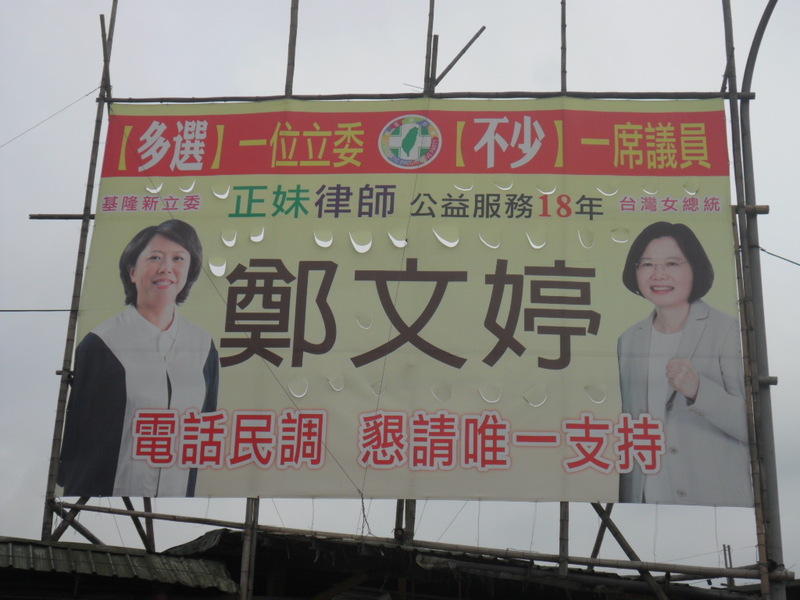 Let’s pop over to Taipei City for a second, where Chueh Mei-sha is one of several people trying to take Alex Tsai’s seat in Nangang and Neihu. Unlike most politicians, Chueh usually puts concrete policy issues into her ads. In this one, she argues that the current education policy is a mess and she wants to clean things up. She doesn’t hint at how she would do this, but at least we know what her top issue would be. 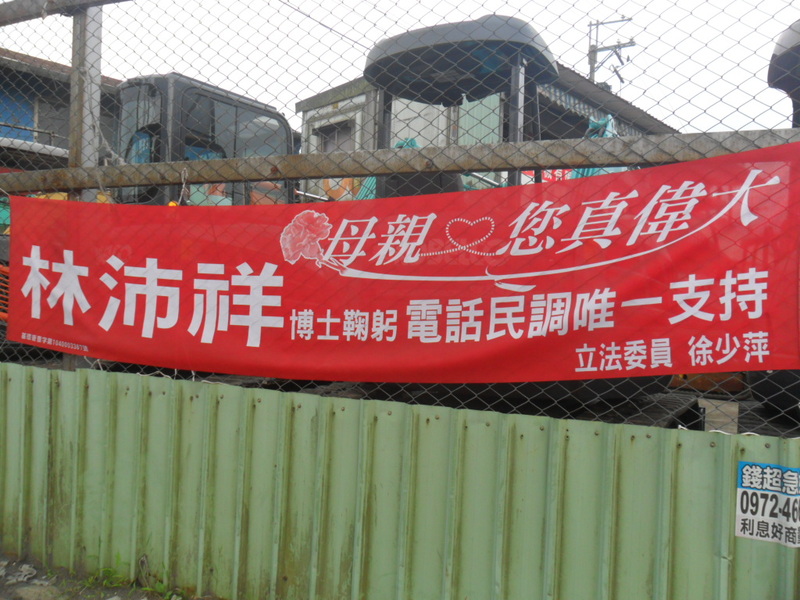 Back to Keelung, where this year’s theme seems to be public service announcements. Han Liang-chi reminds us all to donate blood. Coincidentally, he’s also running for legislator, though he doesn’t mention that in this ad. He must believe in subtlety. By the way, Han ran for the KMT mayoral nomination in 2014, but he lost to Huang Ching-tai. When the KMT revoked Huang’s nomination and drafted Hseih Li-kung, Han was furious. He insisted that they should go back to the primary system where he might be the winner. Han eventually decided to run for re-election to the city council, but he ran as an independent to protest the party’s unfair processes. He won easily. I guess he reconciled with the KMT, because this year he is back in the party trying to win the legislative nomination. Han also wishes all the mothers a happy Mother’s Day. Wow! This guy takes some controversial positions! Ho Sheng-lung is another contestant for the KMT nomination. He wants us to know that he has two MAs and did well on one of the national civil service exams. This makes him a finance and economics expert! Also, this is a public service ad, since he and nine lawyers will consult with you twice a week. Ho is a bit like Han. 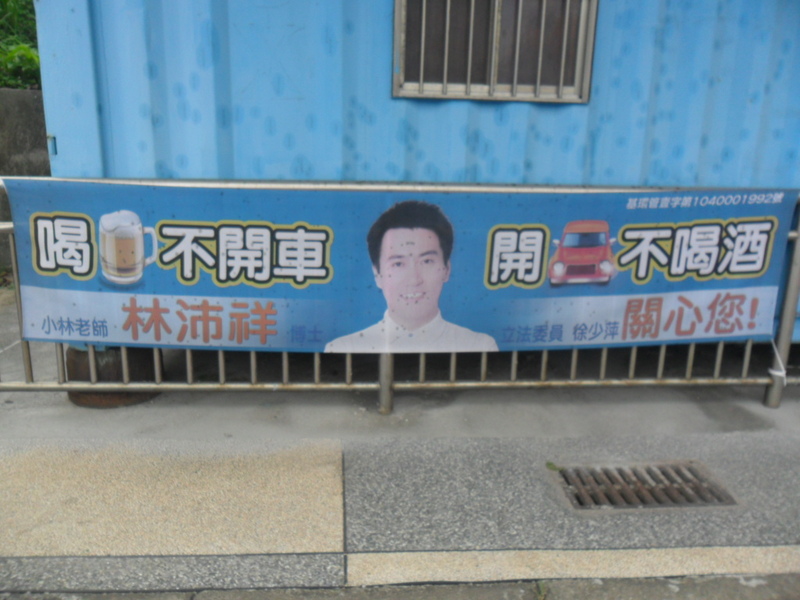 He is a longtime politician in Keelung. He used to be on the city council, but he has bigger ambitions. He has run for legislator and mayor a few times, though sadly he seems unable to connect with voters. His only victory in these higher-level races was in a legislative by-election several years ago. Chen Tung-tsai does a two-for-one. This ad wishes you both a happy Mother’s Day and a happy Dragon Boat Festival. Clearly Chen understands the concept of economies of scale. 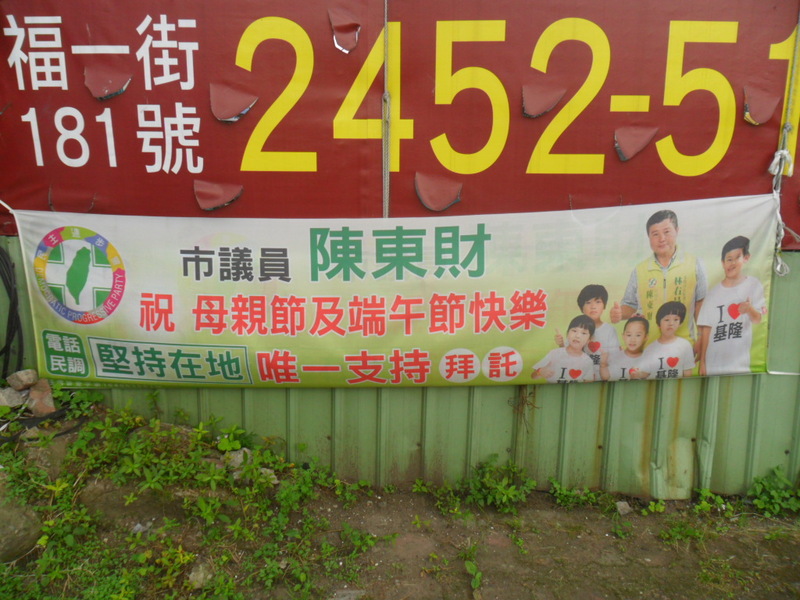 I’m not sure if this is significant, but the kids in the ad are wearing shirts that say “I heart Keelung.” This was the logo from Lin You-chang’s mayoral race last year, so the unstated implication is that Chen is Lin’s candidate. Hey, check it out! Here’s a sign inviting us all to join the Min-kuo Party. For a party with no ideals, no political stars, and no reason to expect to win anything, someone sure is optimistically spending an awful lot of money. The rest of my pictures are ads for this guy, Lin Pei-hsiang. If it looks like he has a professional photographer doing his ads and a professional campaign consultant running things, he probably does. His mother is longtime KMT leigslator Hsu Shao-ping, and his father was former mayor Lin Shui-mu. His mother is retiring this year, and she is trying to pass the family business onto the next generation. Interestingly, he never tells us about his parentage in his ads, even though they all mention his mother. In this one, the final line says that Hsu “guarantees and recommends” him. On this sound truck, Lin tackles a concrete issue. 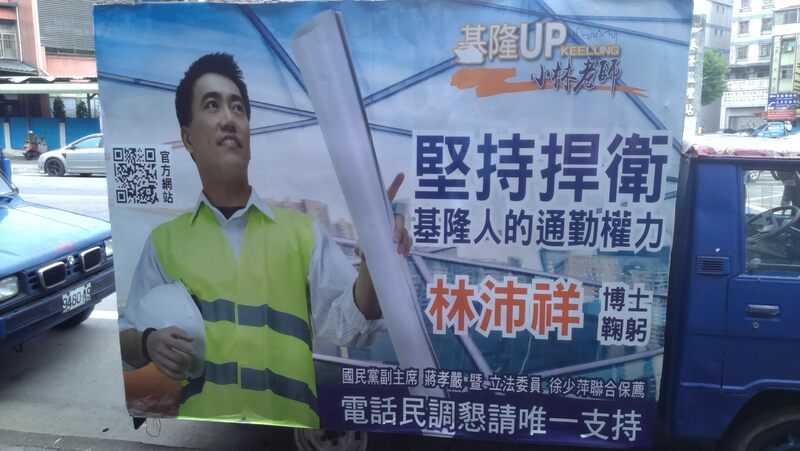 He promises to protect the rights of Keelung residents to a reasonable commute. This refers to the Taipei city government’s decision to close down the bus station next to the Taipei railway station, where many of the Keelung-Taipei buses disembark. Note the small print. In addition to his mother, Lin is also endorsed by KMT deputy chair Chiang Hsiao-yen. 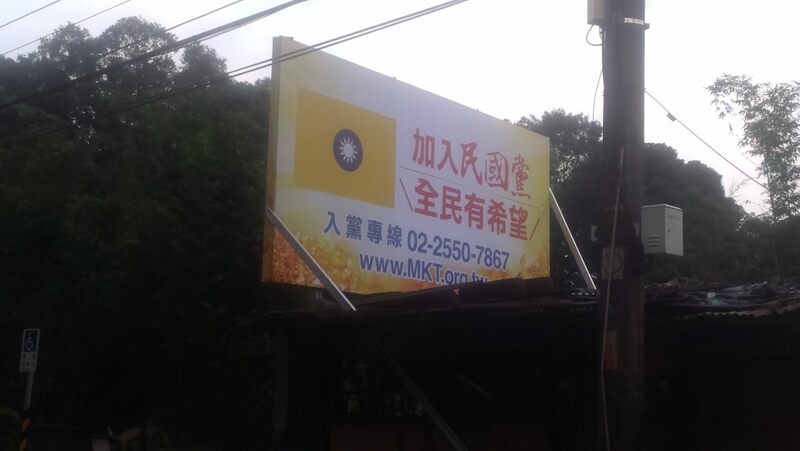 I’ve seen KMT candidates associating themselves with lots of stars, such as Jason Hu, Eric Chu, Hau Lung-bin, and so on, but this might be the first time I’ve seen an ad touting Chiang’s support. If Chiang’s son wins his district, Chiang Hsiao-yen might have two seats in the legislature! This is the kicker. Lin Pei-hsiang tells us that “Mothers, you are really fantastic!” Oh, and don’t forget to support him in the telephone polls. 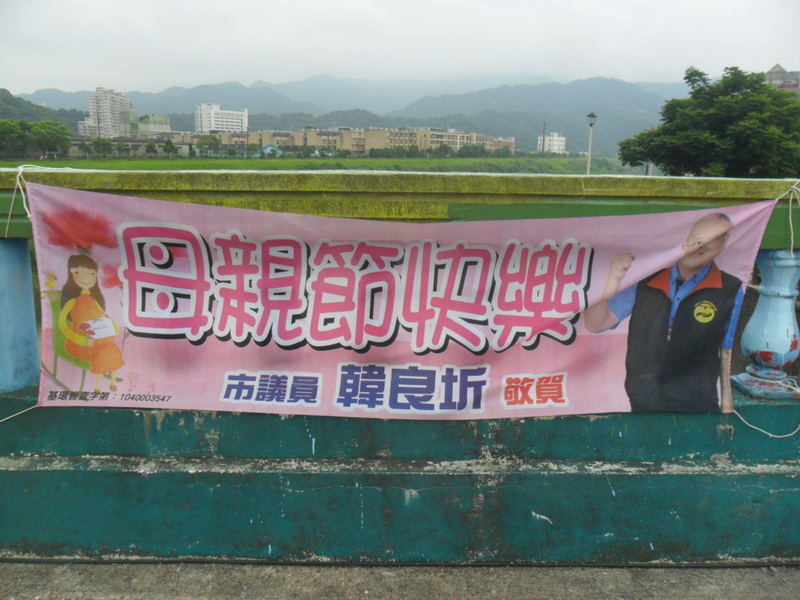 In the bottom right corner, it says “Legislator Hsu Shao-ping.” I think that means that this banner was officially put up by Hsu’s office, and since it marginally passes as a public service message extolling the virtues of mothers, it might have been paid for with public funds. Mothers really are fantastic! You are currently browsing the Frozen Garlic blog archives for May, 2015.